Exede is a High Speed Satellite Internet provider, which was launched by ViaSat in 2012. Exede offers a number of internet service plans for rural homes across The United States. 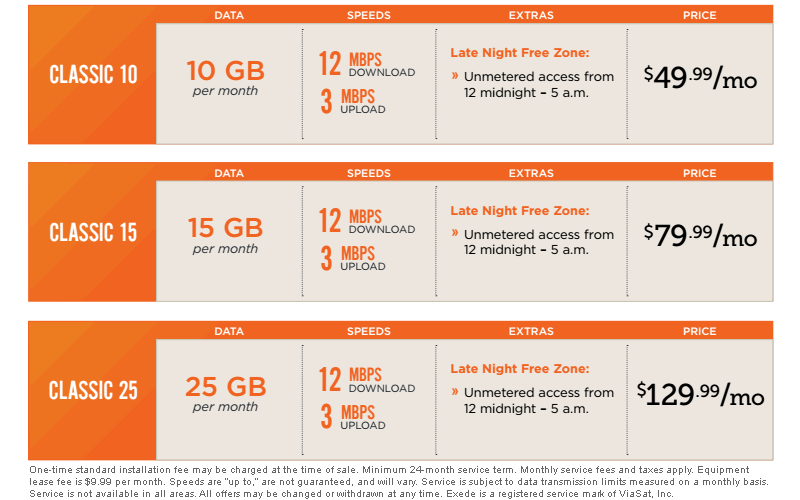 Exede offers fast speeds and large amounts of data, but it can be pricier than the competiion. How Much Does Exede Cost? 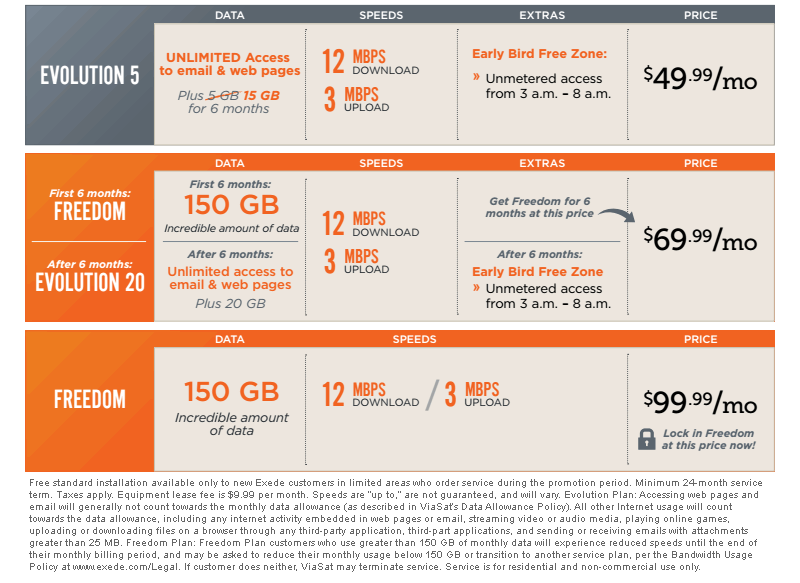 Pricing for Exede's internet is dependent on the data and speeds associated with the package that you pick. 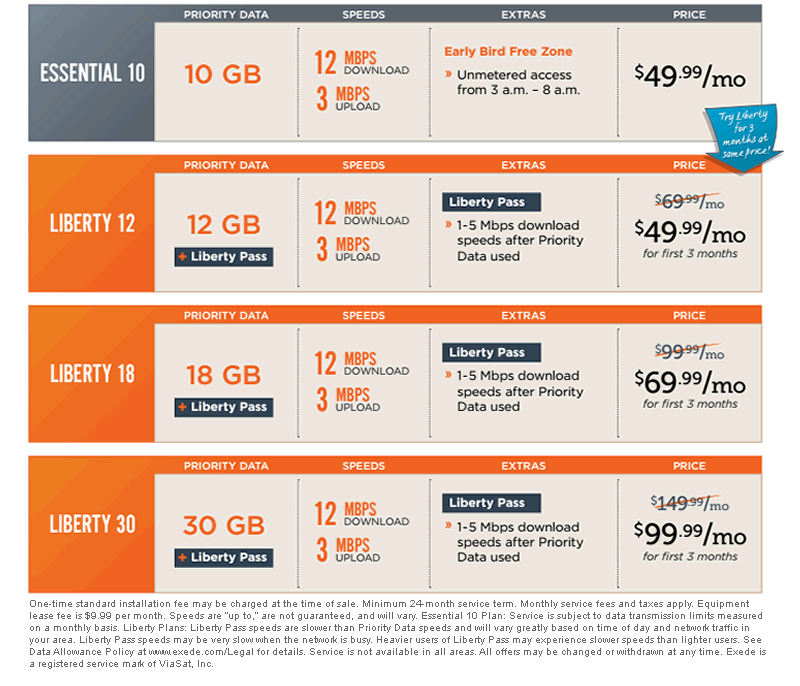 Classic: These plans come with Priority Data and include "Late Night Free Zone" and "Early Bird Free Zone"
Liberty: These plans come with Priority Data and include unmetered access at slower speeds called "Liberty Pass"
Like data, speeds are going to be dependent upon the plan selected and availability in your area, but Exede does offer download speeds up to 25Mbps. These speeds are fast enough for most normal use, but Satellite Internet is not ideal for fast twitch gaming or the use of Virtual Private Networks (VPNs). There are options to both purchase and lease equipment from Exede. The equipment required for Satellite Internet access is the satellite dish and a modem. If you want to access the internet wireless through a wifi network, you will also need a wireless router to connect to your modem. This can also be purchased or leased through Exede, depending on your plan. We reccomend purchasing your own wireless router, unless you have the option to upgrade to the Boost 25 Plan on select plans. This upgrade allows your to reach download speeds of 25Mbps and comes with an included wifi router. While there are multiple options for Satellite Internet in the United States, we have found that for high usage customers, who need fast download speeds that Exede can offer a great value based on location.